Centre Visit: every time you visit Logan Central Plaza your account will automatically be allocated 5 points (once per day). Your points will be shown on the home page of the Brook Rewards app on your phone. They will also be shown each time you go to redeem a prize or offer. 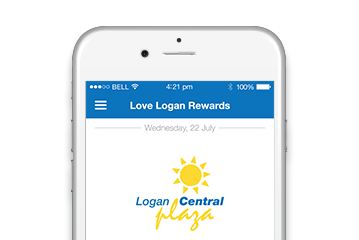 Unfortunately, the Love Logan Rewards program is only available to customers with a smart phone. There may be some smart phones that are not compatible with the Love Logan Rewards program, however we are continually monitoring and updating the list of compatible devices. Every Logan Central Plaza customer over the age of 15 years is eligible to participate in the scheme, providing they have a compatible smart phone. Logan Central Plaza retail staff and contractors are also eligible, however are not able to accrue points in the store they are employed by. Generally, points cannot be collected after your purchase however in exceptional circumstances, a customer may be able to receive their point’s allocation by bringing the relevant receipt to Centre Management, located upstairs above Centre Court at our middle entry. To leave the program simply delete the app from your mobile phone and unsubscribe from the Love Logan Rewards emails.